The Palais Royale Panel Bed by AICO Furniture is reminiscent of the elaborate detailing of the classic French Rococo styling with its intricate veneer work undulating curves and exuberant floral embellishments. Rococo furniture took on a role of comfort and versatility and Palais Royale Collection follows the example. Throughout the collection the accent furniture pieces can be moved from room to room seamlessly blending into the dÃ©cor. As well each piece has been carefully designed for maximum comfort. 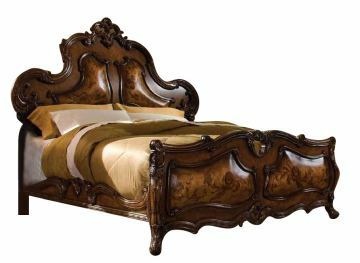 The magnificent mansion bed boasts a unique pillowed wood design that beckons a closer look. Like its predecessors this Rococo styling contains lighter elements with plenty of curves and natural intricate patterns. Palais Royale Bedroom Collection is scaled and proportioned to suit any home with impressive elegance and is finished in a wonderful Rococo Cognac.